'Throwback Manila' Relives the Disco Era This September! One ultimate 'throwback event' is set to conquer Manila on September 27 (Friday) as "Throwback Manila: A Vinyl Disco Experience" spins back the vinyl disco records of the 70s, 80s and 90s that will not only revive the memories of the carefree days of yesteryears but also reintroduce the classic dance songs to the younger generation. Produced by 8 Circles Events Management, "Throwback Manila: A Vinyl Disco Experience" which will be staged at the NBC Tent at The Fort, Taguig City, will bring back together for the first time eight of the most famous DJs and icons of the disco generation--Jon Tupaz, Lopie Guzman, Boyet Sison, Martin Porta, Manolet Santos, Bobby Nolasco, Arnel Castillo and Tito Jante. Guaranteed to be a glittering night of fun, reminiscing, and making of new fantastic memories, "Throwback Manila: A Vinyl Disco Experience" will open through explosive dance performances highlighting moves popularized in the hottest discos in Manila like Faces, Stargazer, Euphoria, Mars, Rumors etc. Also, expect an elaborate lighting system that will throb to the beat of the music along with iconic disco elements like mirror balls and ledges. Disco Fashion of the 70s, 80 and 90s will also dominate the scene. Get those disco outfits ready for an unforgettable 'throwback trip' that everyone would enjoy! 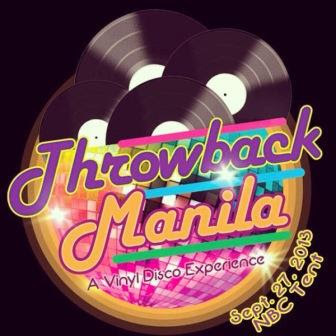 Don't miss "Throwback Manila: A Vinyl Disco Experience" on September 27, 7PM, at NBC Tent at The Fort, Taguig City.